It was snowing and low-20s when I left the house this morning, which made the commute a little treacherous! I used main roads for the best surface possible, but that also meant that there was lots of slush to contend with, which ended up freezing on the bike. Not ideal to have icy rims and brakes, but I just had to pump the brakes regularly to keep them clear. I was going to do the bike path, but it was completely covered with snow! The only trouble was when I got to work and found that both my locks had frozen! I used my emergency lock while I ran upstairs to fill a jug with hot water, which did the trick. Of course, if it stays below freezing all day, I'll probably have to do the same at the end of the day. I ran into the building super on the way in, and he recommended that I get a spray can of de-icer. Probably not the most sustainable solution, but that may be preferable to having no locks! There's a nice little (unscientific) survey about commuting to work on Kent's blog. I've replied... nothing groundbreaking, though. My Finnish tires turned up sure enough, and they seem very nice indeed. I can see how they'd be very useful for lots of riding over lots of consistently grisly, frozen terrain. 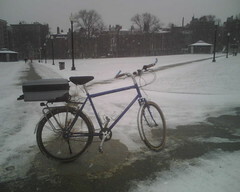 But as rough as Somerville Ave is these days, I don't think that warrants switching to studded snow tires. So I blew $100 for nuthin... wouldn't be the first time. I rode to work this morning, and despite a temperature in the teens and remnants of 10 inches of snow from a few days ago, I was still fine with my Panaracers. A little extra vigilance is the important thing. Yesterday I brought the bike inside and spent an hour or so cleaning the drivetrain. I did a pretty thorough job on the chain, chainring, and rear sprocket, using various Pedro's cleaning supplies and a couple Clorox wipes. Ran very smoothly today.